ST. LOUIS, Aug. 31, 2017 /PRNewswire/ -- Shelter pets across the metropolitan St. Louis area have a new, unexpected hero – Urban Underdog – thanks to a collaboration between two local pet-loving businesses. 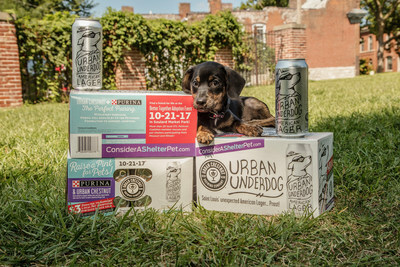 Purina is teaming up with Urban Chestnut Brewing Company for a joint philanthropic effort linked with Urban Chestnut's newest beer – Urban Underdog American Lager – available at grocery stores and beer retailers in St. Louis city, St. Louis and St. Charles counties and the Metro East area. For every specially marked eight-pack of Urban Underdog American Lager sold at area retailers from Sept. 1 through Oct. 21, Purina will donate $3 to the Petfinder Foundation to help offset adoption fees at area shelters giving pet lovers and beer lovers alike a simple way to help local adoptable pets find forever homes. The partnership is a new dimension to Purina's annual "Consider A Shelter Pet" campaign, which urges residents of the St. Louis region to get to know shelter pets as they really are – happy, healthy, lifelong companions looking for loving homes. This year's campaign culminates in the single-day "Better Together" adoption event that will feature more than 200 adoptable pets from 10 a.m. to 3 p.m. Saturday, Oct. 21, in Soulard Market Park. "Urban Chestnut shares our passion for pet-related causes, as well as our sincere belief that pets and people are better together," said Libby Davidson from the Purina Pet Welfare Team. "By working together, we're giving fellow pet lovers two ways to help local shelter pets – buy beer and consider adding a four-legged family member to your home." Urban Chestnut collaborated with Purina to design special "Consider A Shelter Pet" packaging for the new Urban Underdog brew, featuring campaign details and a special 'Undercat' on the box as a reminder that there are plenty of fabulous felines in shelters looking for love. Over the course of the campaign, Purina will donate up to $50,000 based on beer sales to provide $50 subsidies toward adoption fees during the Oct. 21 "Better Together" event and at participating shelters. "We've been passionate supporters of local pet adoption agencies and causes since the day we opened our doors," said David Wolfe co-owner and co-founder of Urban Chestnut Brewing Company. "Every day at our pet-friendly breweries we see the benefits of people being together with their pets and the positive atmosphere it creates. Our partnership with Purina will help more shelter pets find their forever homes and that benefits everyone in the St. Louis community." With only 27 percent of household pets adopted from shelters nationwide*, the need to consider shelter pets as the perfect addition to the family is urgent. Purina believes the low adoption numbers are due in part to some common misperceptions about the behavior, health and age of shelter pets. "Shelter pets are curious, funny and loyal companions looking for love," said Davidson. "Opening your heart and home to a homeless dog or cat can positively change your life." For more information about Purina's "Consider A Shelter Pet" campaign and events, a list of participating shelters, or help finding adoptable pets in your area, visit www.considerashelterpet.com.